As you know, we spent the summer road-tripping just a weeeee bit. I think I lost track of all the adventures we took that started before school even let out last spring, but I know it included drives to St. Louis to Geekway, a Chicago Cubs game at Wrigley, Indianapolis for Gen Con, Columbus (Ohio) for Origins Game Fair and Washington D.C. to be tourists. 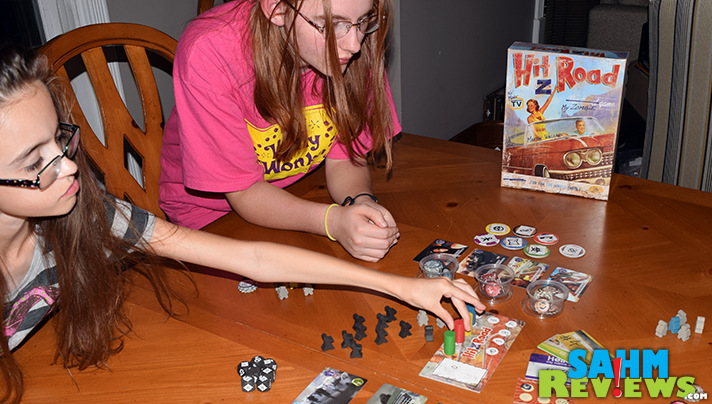 Thankfully, things are different for our kids as well as those in the alternate reality of the game Hit Z Road by Asmodee. 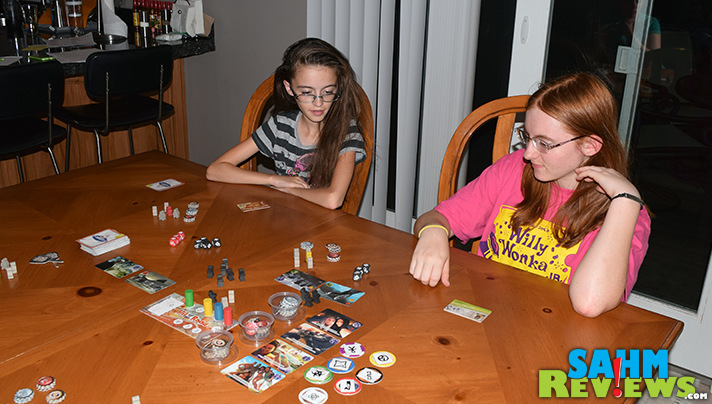 My kids have a variety of electronic options and board games to keep them busy. Sure seems like a walk in the park compared to fighting zombies along the trip which is the theme of this adventure-filled game. 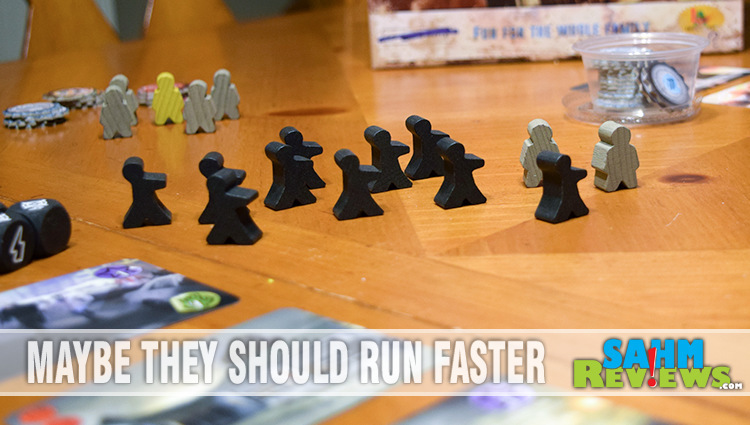 We had a chance to test out this game during Gen Con. In addition to playing it, we learned some inside scoop about the game as well. While I enjoyed the game, I appreciated the small nuances of the design even more. The concept is that Martin and his family are traveling from Chicago to Los Angeles in a post-apocalyptic, zombie-ridden world. With a ton of free time when he wasn’t creating zombie ammo for his dad, Martin created a game about his cross-country road trip. They traversed Route 66, battled zombies and scavenged for whatever they thought they could utilize. 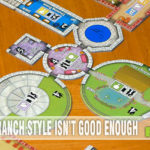 Using whatever resources he could scrounge, he made a set of “handwritten” rules and game pieces. Among them are tokens made of bottle caps, a handful of cards from Dixit and 7 Wonders, some playing cards, a used nametag and old credit cards and even a partially used rewards card for a burger joint. The whole set of instructions and pieces look like something out of a Diary of a Wimpy Kid book, except it has zombies. Start by setting up the game board for up to 4 players, each with their lead survivor, 3 of each type of token (ammo, adrenaline and gas) and 4 survivor friends. Mind you, I use the word “friends” loosely because those are the first ones you’ll be tossing at the zombies when they overrun you. The primary requirement to win the game is have at least one person in the party make it to the destination. More about that later. The game is labeled as 12+ but honestly, it’s not graphic nor harsh. 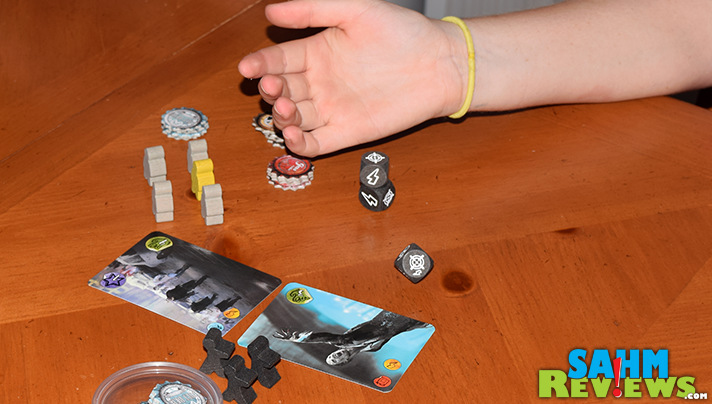 It’s zombies, yes, but since it is primarily a dice game, it is no different then playing something like Martian Dice. Getting attacked by zombies doesn’t make the dice bleed or anything (although that would be a pretty interesting twist.) It is a strategy game and there is a degree of analysis required but I think kids as young as 8 that are used to playing games could probably grasp the game mechanics and instructions without a problem. 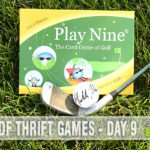 Played over 8 rounds, each consists of three phases: Planning, Auction and Encounter. At the beginning of each round, epilogue cards are set out offering routes for each player to plan their westward route. The Auction Phase is what determines the order in which the players will select their routes. Some are easier with simple gathering of resources while others show evidence of zombies. Players bid using their resources of ammo, adrenaline and gas to vie for that first spot because it’s obviously better to be able to take the path of less zombies than to battle them head on. But it’s a balancing act because each player has limited resources so spending them on the auction process may leave them defenseless during the actual journey! Whatever they bid, they have to pay even if others outbid them and they end up with the last choice. There are three levels of cards in the stack and they get more difficult as the rounds progress. The final step of the round is the Encounter Phase where routes are selected, resources are gathered and zombies are battled. 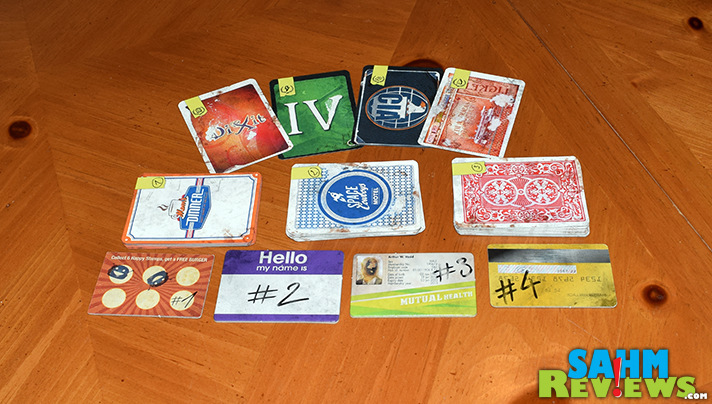 Each route includes two epilogue cards which are done sequentially from left to right, completely finishing one before moving onto the next. Each epilogue card has three parts to it. 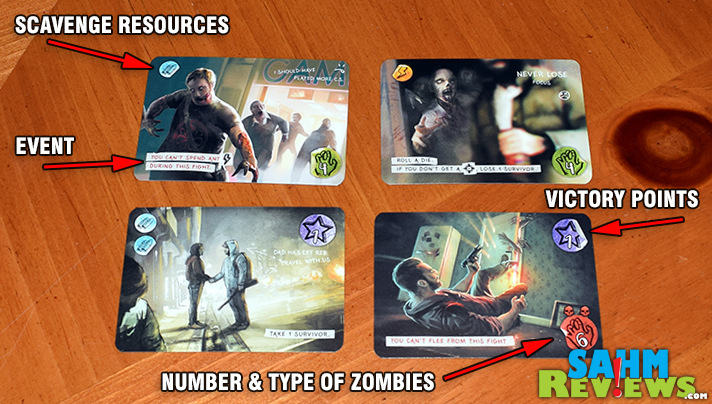 The available resources to scavenge, the event that you’ll find yourself stepping into and the number and severity of the zombies you’ll be fighting as you Hit Z Road. Approach an area, gather all the available resources then survey the situation. If you feel like you’re a bit of a sharpshooter, spend the ammo and try to take the zombies out from a distance. For each piece of ammo, two dice are rolled and hits knock out some of the bad guys. If you find that your marksmanship is less than efficient, there are two options. Stay and fight or burn some fuel and flee. Successfully defeating the zombies means you’ll get the adventure card and the values on it whereas fleeing means you lose two gas tokens but spare some lives. Some of the zombies aren’t quite so nasty and are easier to pick off while others run in a horde and are much more difficult to endure. These are determined by the handprint in the lower right of each card. A green one represents the easier with battles fought using the black dice. 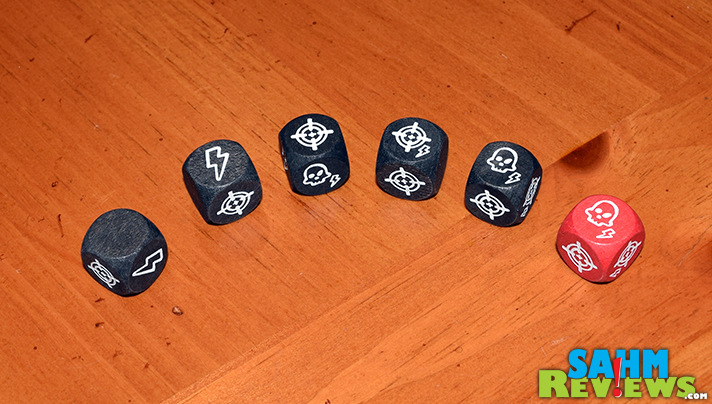 Those dice include a blank side (dodge), a lightning bolt (zombie is close but spend an adrenaline to kill him), two sides with a target (kill), a target with a lightning bolt (bonus kill: spend an adrenaline to knock out another zombie) and a skull with lightning bolt (your survivor was bit but can be saved by spending an adrenaline token.) The red “horde” dice aren’t quite so forgiving. The blank side is replaced with a skull where you lose a survivor without any recourse or opportunity to save them with adrenaline. You’ll roll one die for each survivor you currently have in your group. If at any point you run out of survivors, you are out of the game because, duh, everyone in your party died. This isn’t a game of last many standing wins either. As I said before, to win, a player must make it to the destination with at least one survivor. If two or more players make it then points for completed battles are calculated as well as various bonuses that may have been scavenged over the course of the Hit Z Road trip. 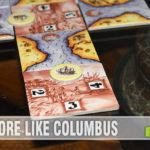 If you’re looking for an in-depth strategy game, Asmodee has many other options that fit that bill. 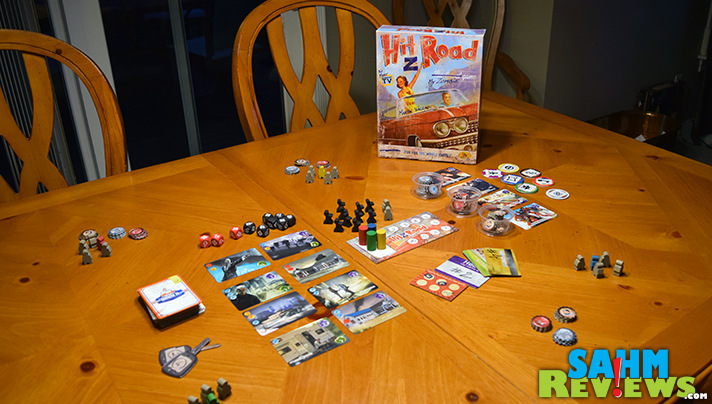 Hit Z Road is a lighter, easier to grasp game that is ideal for newer gamers and can be purchased from Amazon for under $40 or visit Asmodee’s website to find a retailer. Learn more about what they have in the works by following them on Facebook and Twitter. What was your biggest road trip catastrophe? I’m not really into zombies, but I’ll admit this game looks pretty fun. And the back story behind it is pretty great too. This looks like a very intriguing game. I’m trying to decide what would be the best Zombie game to have in my collection. No kidding! 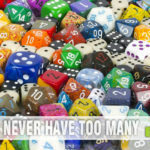 We’ll keep pushing on Asmodee to help us out with an extra one to give! Thanks, I’d been wondering if this was any good. Looks like a fun game with some interesting components. Hopefully there is not too much to track for new/non-gamers.